toxic toners, developers and reducers. flammable solvents in film cleaners. Wear chemical-resistant gloves when working with toners, developers, reducers and stabilizers. Wear gloves, splash goggles and protective clothing when working with corrosive stop bath and intensifying chemicals. Buy your chemicals premixed to eliminate toxic and corrosive dust. Purchase acetic acid pre-diluted to a concentration under 50 percent. Switch to water-based solvent cleaners to reduce toxic solvent vapors. Store cyanide-containing compounds away from ultraviolet (UV) light, heat and acids. When mixing photo developers or stabilizers with water, either use a glove box or local exhaust ventilation to protect you from hazardous dust. Glove boxes have been inexpensively made by many artists. mixing dry toners, developers, reducers and intensifiers. working with toxic toners, intensifiers and solvents. Use liquid toners, developers and reducers instead of powders to eliminate toxic dust. Purchase pre-diluted stop bath solution to reduce the risk of chemical burns. Intensifiers may contain corrosive hydrochloric acid, cancer-causing dichromate compounds or toxic cyanide and mercury compounds. Farmer’s reducer is a safer substitute but keep it away from contact with acid, UV light or heat. Toners may contain toxic selenium, sulfide or thiourea compounds. Use premixed toners to limit toxic dusts. Developers contain toxic ingredients like catechol, p-phenylene diamine, pyrogallic acid, and hydroquinone that can cause severe skin allergies on contact. Buy premixed developers to eliminate hazardous dusts. 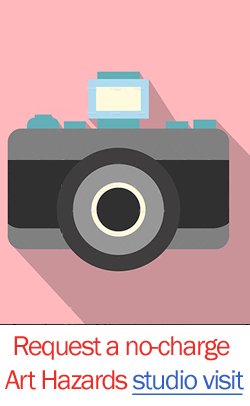 Photo reducers may contain strong oxidizers like potassium permanganate. Store and use these reducers away from flammable solvents. Most color stabilizers contain cancer-causing formaldehyde. Wear protective gloves and protect your lungs when working with color stabilizers. 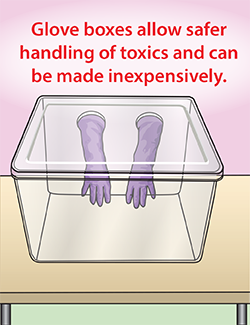 Use a plastic secondary containment tub under waste collection containers to control spills and leaks. Unused photochemicals must be disposed as hazardous waste. Unused film can be disposed in the garbage. Spent black and white developer can be disposed to the sanitary sewer. Collect and store spent photo fixer in a separate container. Then deliver it to a silver reclaimer. Learn how to dispose of your art studio wastes.